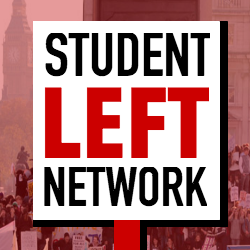 Student Left: Unite to stop the gutting of NUS democracy and Liberation! By a NUS Trans Campaign committee member It was revealed a few weeks ago that the NUS would be making far-reaching cuts to address a £3 million deficit and keep the organisation afloat. These cuts, as we understand it, are set to be most acutely felt in the NUS’ democratic sections: the sections that are … Continue reading Student Left: Unite to stop the gutting of NUS democracy and Liberation!